Paul's nephew, Jordan, and his wife, Karyn, and expecting their first baby in the fall. Naturally, my first thought was "baby quilt!" I debated which pattern to use for a while, but I've decided to re-make my Friendship Galaxy quilt. The Friendship Galaxy pattern is available in my Etsy and Payhip shops. Here is the original that I made last fall. I want to make it again with a less-busy background print. Though I do love those Connecting Threads rockets (affiliate link), I find they overpower the small stars a bit. 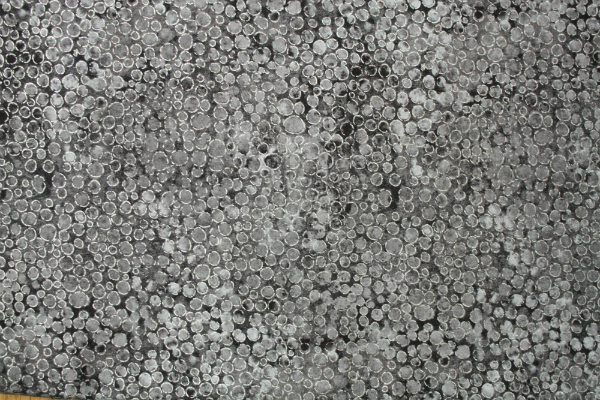 I picked up this Northcott Artisan Shimmer print a couple of weeks ago to use as the background. I love the shimmer! Jordan and Karyn don't know if they're having a boy or a girl, so I figure this fun black/grey works for either, plus it will really make the stars pop. Then last night I started pulling fabrics for the stars. 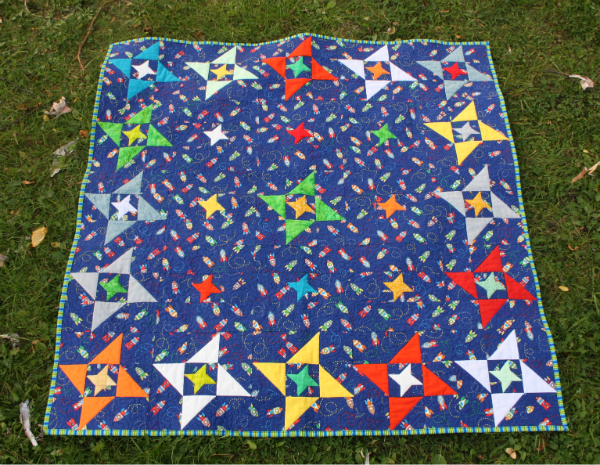 Those small stars only need a scrap of fabric 3 1/2" x 4", so they're great for using up small pieces. Once I had lots of scraps pulled, I went digging in my main stash and this is what I ended up with. As you can see, my reds are a little skimpy, so I may see if I can find another red or two, but other than that I'm pleased with this grouping. There are quite a few Connecting Threads fabrics (affiliate link), some batiks, some Kona solids and some mystery prints that I've had so long I have no idea where they came from! Now it's time to get cutting! 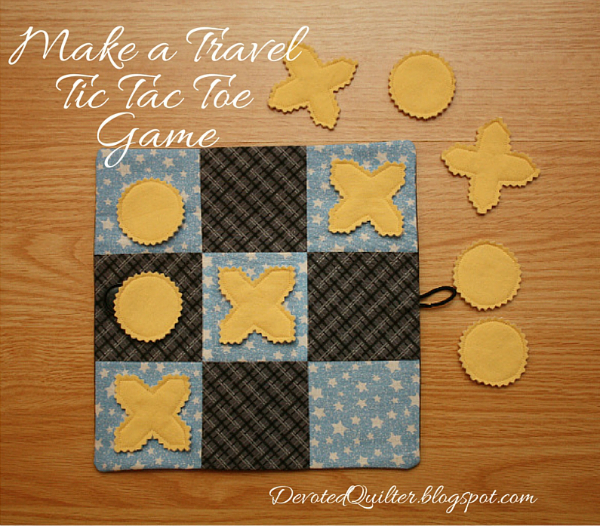 Linking to Let's Bee Social, NTT and the Needle and Thread Network's WIP Wednesday. Here we are already, on week 8 of the fruit of the Spirit devotion series! I have been finding it amazing to really focus on all the character traits the Holy Spirit can cause to grow in our lives if only we allow Him to work in us. I hope you've been enjoying this series too! If you've missed any, you can easily get caught up - here are all the links to the introduction, love, joy, peace, patience, kindness and goodness. And just as a reminder, here is the verse on which I've based this series: Galatians 5:22,23 "But the fruit of the Spirit is love, joy, peace, forbearance, kindness, goodness, faithfulness, gentleness and self-control. Against such things there is no law." When I think about faithfulness, I think of the faithfulness between a husband and wife who have taken a vow to remain together for better and for worse and to never turn away from each other. There will be good times and not-so-good times, but those who are faithful do not abandon each other or decide to seek out a relationship with someone else to replace their spouse. God calls His relationship with us a 'covenant', which indicates a vow or promise. He has chosen this relationship with us and Jesus promised us "surely I am with you always, to the very end of the age” (Matthew 28:20). Nothing will cause God to abandon us or to decide to choose someone to replace us. Paul wrote, "For I am convinced that neither death nor life, neither angels nor demons, neither the present nor the future, nor any powers, neither height nor depth, nor anything else in all creation, will be able to separate us from the love of God that is in Christ Jesus our Lord" (Romans 8:38,39). Nothing in all of creation can cause God to renounce His relationship with us! Of course, faithfulness doesn't only come into play in a marriage. 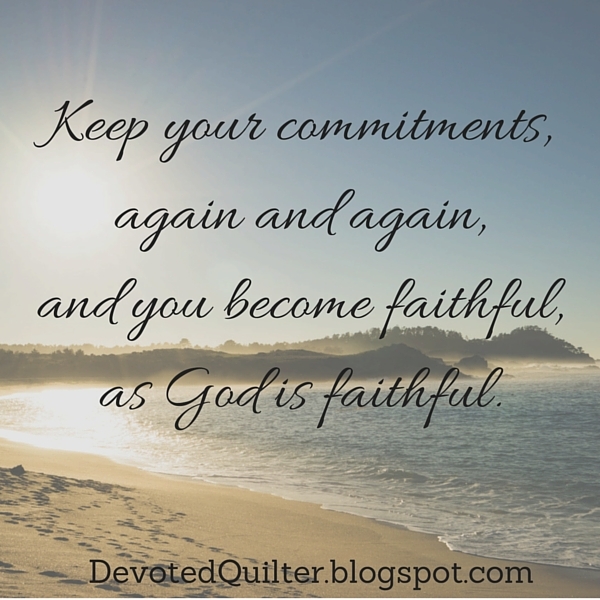 Faithfulness is really a matter of commitment. Commitment to doing what we said we would do, or being where we said we would be even if, in the moment, we don't feel like doing those things or going to those places. Faithfulness means our word means something. Unfortunately, faithfulness can be hard. Sometimes we just don't want to follow through on our commitments. We don't want to do the work we said we would do. Relationships (any relationship, not just marriage) can be hard and it can be tempting to seek out something new. Sometimes we just want to be selfish and ignore the promises we made. Thankfully, the Holy Spirit nudges us in those moments. I know I have felt it and you probably have to. It's that feeling that we are not doing the right thing, that we need to follow through on what we said we would do, whatever that may be at the moment. If we will obey those nudges, those reminders that God's faithfulness should be evident in His people, then gradually faithfulness will become our norm. Give in to the temptation to blow off a commitment once and it becomes easier to do it the next time. But keep your commitments again and again and the voice of temptation will have less of a hold on you. You will become faithful, as God is faithful. It's week 7 of our fruit of the Spirit devotion series and this week we're thinking about goodness. Once again, if you're just joining in, or if you've missed a few posts, you can get caught up with the introduction, love, joy, peace, patience and kindness. Our verse for this series is Galatians 5:22,23, which says, "But the fruit of the Spirit is love, joy, peace, forbearance, kindness, goodness, faithfulness, gentleness and self-control. Against such things there is no law." The original word that Paul used for goodness, agathōsynē, means "uprightness of heart and life, goodness, kindness." In planning for this devotion, I immediately thought of this verse, "Do not conform to the pattern of this world, but be transformed by the renewing of your mind. Then you will be able to test and approve what God’s will is—his good, pleasing and perfect will" (Romans 12:2). It feels like there is a decided lack of goodness these days. We have all, much too frequently, felt sorrow and disbelief when we heard about the tragedies around the world. There is no denying that 'the pattern of this world' is far removed from the 'good, pleasing and perfect will' of God. Thankfully, the vast majority of people will never intentionally harm another person, but even still, we all know that it's hard to be truly good. Just spend time with any toddler and you'll quickly learn just how natural it is for us humans to be selfish and mean and demanding. Between raising my own boys and babysitting toddlers belonging to others, I have witnessed many, many tantrums, pokes, pushes, grabs, etc. Toddlers want what they want, right now, and they're not concerned with how that might affect others. That is, in a nutshell, the natural human state, which is why parents have to teach their child to behave like a 'civilized person'. Goodness doesn't come naturally. It has to be learned and it takes effort. That is why Paul tells us to be transformed by the renewing of our minds. 'Renewing' here carries the idea of a renovation, of changing something for the better. 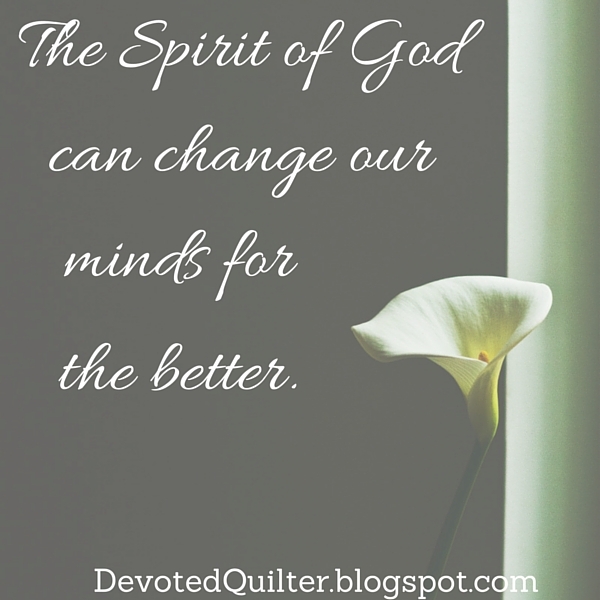 So, the Spirit of God will change our minds for the better, allowing us to be no longer bound to the pattern of the world, but instead to think and act according to the will of God. This renewing of our minds is an ongoing process as the Spirit changes our attitudes and behavior in different ways, bringing us ever closer to being like Jesus. Gradually, the more we walk with the Spirit and allow Him to work in our lives, the more we will grow in goodness. And this world can certainly use more goodness. And now, meet my Snow Friends! 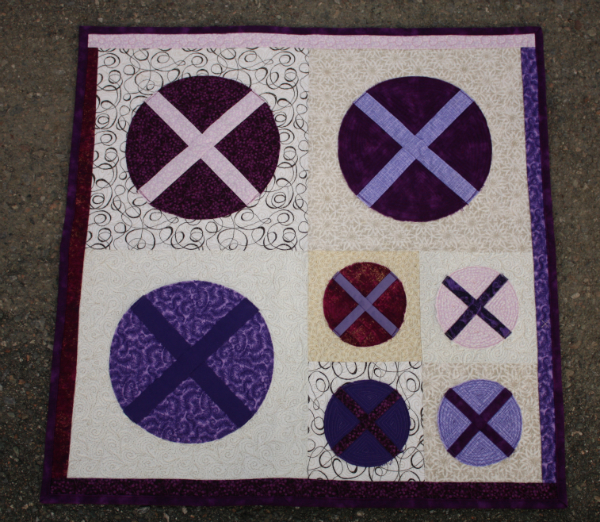 This quilt came about because I wanted to re-do the first pattern I ever offered for sale. 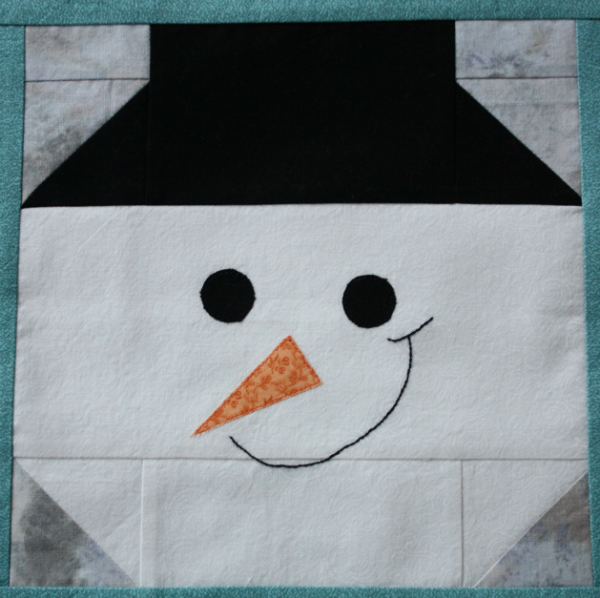 Portrait of a Snowman was my design for one 12" block and I was so excited when I first offered it for sale. Almost immediately after posting it for sale, though, I realized it could have been constructed differently, which would have eliminated the seams across his face. It has kind of nagged at me ever since, but I never really made time for it until Sarah, at Confessions of a Fabric Addict, asked if anyone would be interested in a Christmas in July blog hop. I signed up right away, figuring it would be the perfect opportunity to get this pattern redone. And it was! This is my new version of that first snowman. I like him so much better without those seams in his face. I like the shape of his hat better too. 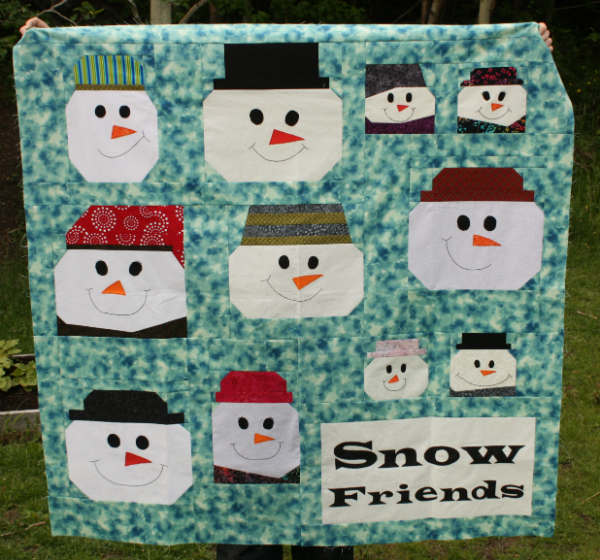 Since I was re-doing the pattern, I also wanted to make it into a full quilt, rather than just a single block, so that meant my first snowman needed some friends. 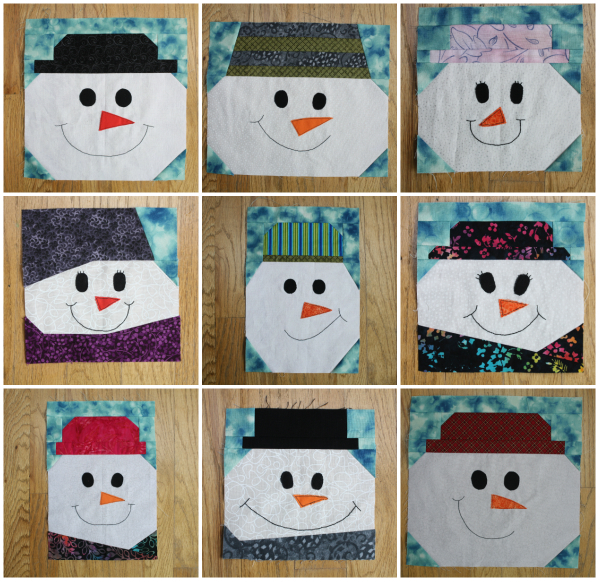 My inspiration for the layout was those picture collage frames you can buy and so I made the snowmen (and women) blocks in a couple of different sizes. There are 12" x 12" blocks, 6" x 6" blocks and a couple that are odd sizes, like 8" x 12". I had a lot of fun drawing the different snow people and then making all the blocks! I love that their character seemed to come alive once I embroidered the mouths on! Merry Christmas, and thanks for stopping by! It's time for another look at the fruit of the Spirit! This week we're moving on to kindness, which marks the halfway point of this series. If you've missed the previous posts on the fruit of the Spirit, you can catch up with the introduction, love, joy, peace and patience. Our verse for this devotion series is Galatians 5:22, 23 "But the fruit of the Spirit is love, joy, peace, forbearance, kindness, goodness, faithfulness, gentleness and self-control. Against such things there is no law." Remember that these are not 9 separate fruit. It is not a case of one person growing love while another grows patience. Rather, these are all different sides of one fruit, all of which the Spirit will cause to grow in our lives if we are willing to listen and walk with Him. So, let's start with the teachers of the law and the Pharisees. They were the religious leaders of the day. The church people, so to speak. They have caught a women 'in the act of adultery' and have dragged her into the temple courts. Can you imagine her shame? Her humiliation? Her fear? Surely she knew the Law of Moses, and that it required an adulterer be stoned. How is it they caught her 'in the act' anyway? And why haven't they dragged her...accomplice...into the temple courts? There are some who think this poor woman was set up, that the man was in on it with the religious leaders who needed someone to use in their attempt to trap Jesus. Lovely, right? Their treatment of someone caught doing wrong has to be the perfect example of anti-kindess. Unfortunately, modern-day church people can be just as bad. We aren't so likely to throw stones at people, but there's no denying we throw words that do at least as much damage as a stone could. Think about the gossip that swirls when someone has an affair, or when someone's kids are in trouble with the law. People are often more than ready to believe the worst, to spread the story near and far and to separate themselves from those who are being accused. When people need kindness they are often given condemnation and shame instead. Now consider Jesus' response. The religious leaders are hoping Jesus will condemn this woman just as they have. Instead, without saying a word, He starts to write on the ground with His finger. How I wish we knew what He wrote! Many speculate that He started writing words like 'liar' or 'gossip,' words that would make these self-righteous men realize that they are not perfect either. Obviously, we don't know if that's the case or not. Whatever He wrote, the crowd kept pushing Him to make a ruling on the woman's fate, so Jesus stood and told them to go ahead and stone her...so long as the one among them who has never sinned is the first to throw a stone. Then He goes back to writing on the ground. Slowly the crowd disperses. I love that it's the older ones who leave first. Are they the ones who are most aware of their own sins? Are the younger ones still determined to focus on the sins of others rather than their own? Eventually, though, they all slip away, leaving Jesus and the woman alone. And He, the only one who had the right to throw a stone at her, the only one who could have condemned her, doesn't. I picture a smile on His face as He looks around where the crowd had stood, then turns to the woman and tells her He doesn't condemn her. I can almost hear the kindness in His voice, can't you? 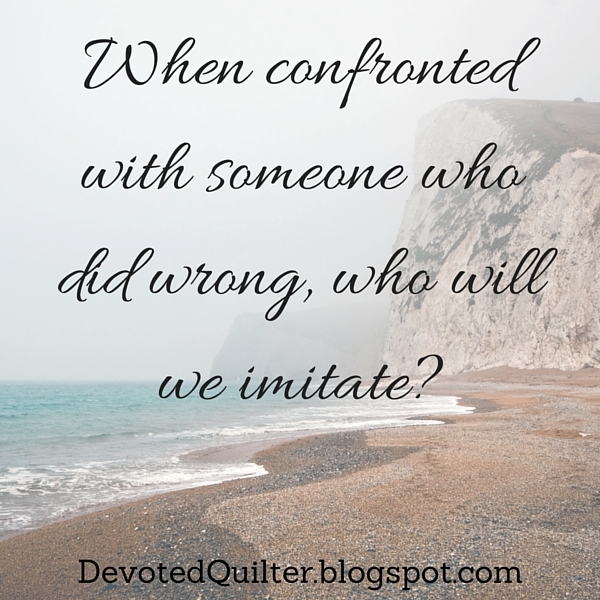 The next time we're confronted with someone who has done wrong, who will we imitate? The religious leaders and Pharisees, who heaped shame and humiliation on the woman (who assuredly already knew she had done wrong), or Jesus, who refused to condemn her? Jesus won't be standing there in that moment, ready to stoop down and write on the ground. But we do have the Holy Spirit within us, ready to remind us of our own sins and the kindness of our Savior, which could stop the stones we might otherwise have thrown. Here we are, past the half-way point of the year already! This seems like a good time to check in with my goals for the year and see if I'm on target. * Host a mystery quilt along. It's something I've been wanting to do for a while, but I've hesitated because I worried my following was too small. In emailing with Cheryl at Meadow Mist Designs, though, she pointed out that a small following might be a good thing for a first quilt along. So, the quilt is designed and I'm ready to pick out fabric and make my test version. I'm thinking maybe a late winter/early spring start. Anybody interested??? Definitely on track for this one! The second-last set of instructions were posted two days ago and it'll all be wrapped up the first Wednesday in August. I've really enjoyed seeing pictures of people's progress each month! *Submit designs to at least two new magazines. So far I've had designs in Make Modern (affiliate link) and Fat Quarterly. I have also sent one design to another magazine, which I haven't heard back about yet, but that one can't count toward my 2016 goal, even if the quilt becomes a 2016 project! I'd also like to continue working with the ladies at Make Modern as I've found they're great to work with. Hmmm...Not so much progress on this one. I have designs ready, but haven't submitted them yet. I even know where I want to send at least one of them, so I just need to buckle down and write the email. As for the project I had already sent to another magazine...that one came back as a no. I do have another project in the works for Make Modern magazine though, and that will be published in their September issue. Plus, my design 'X Marks the Spot' was in the May issue. *Release a new pattern or tutorial every other month. I was going to aim for every month, but I'm pretty sure that's setting myself up for failure, so I'll cut it in half. I can always exceed my own expectations if I'm extra productive, right? 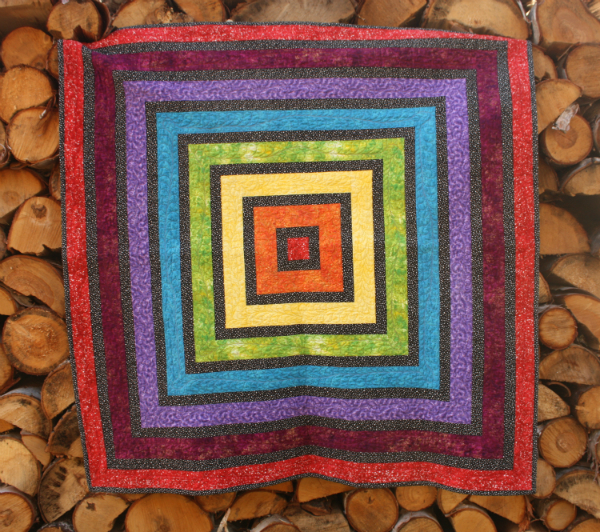 I will allow myself to count the mystery quilt as one of those new patterns, when I release the final instructions. You can see my current patterns in my Payhip and Etsy stores, and my tutorials are all on my Tutorials page. 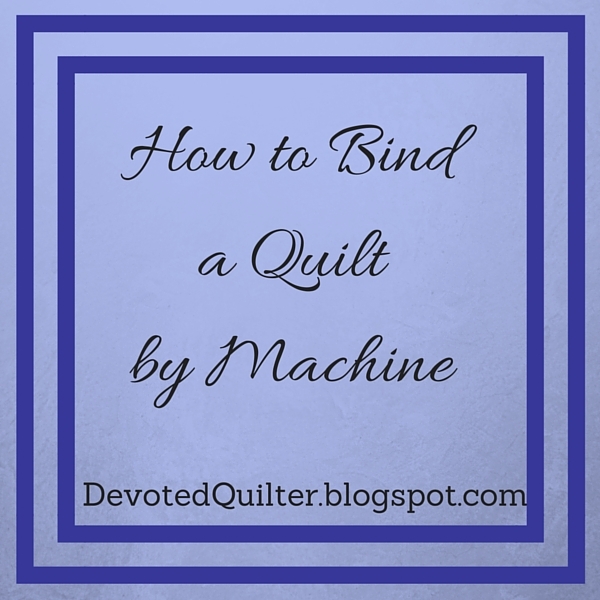 and how to Machine Bind a Quilt. So that puts me at 4 tutorials and 1 pattern release so far for the year. Since I was only requiring one every other month, I'm 2 ahead of my goal! *Get back into a regular Bible reading habit. Last school year I did really well getting up a little earlier to have that time for prayer and Bible reading and I really enjoyed it. This year, though, one of the boys I babysit is dropped off almost an hour earlier than I had last year. I tried getting up early enough, but it just doesn't work for me as I was exhausted all day. So, I've been back to my old (bad) habit of sporadic reading, and that doesn't work for me either. This one still needs work, but I have figured out a system that (mostly) works. I have to ice my back every day for 10 minutes, so I've been using that time for Bible reading. I say it mostly works for two reasons. 1. I sometimes skip icing my back for a day (or more) and so that means I also skip reading and 2. it's only 10 minutes, which means I'm not reading a lot. It is better than none, though, and I haven't abandoned it when school ended, which I had done in previous years. So I'm calling this one a work-in-progress. *Have fun exploring (some) new ideas. Quilting is what I do for fun, after all! The whole Denim Days series I did in February falls into this category. 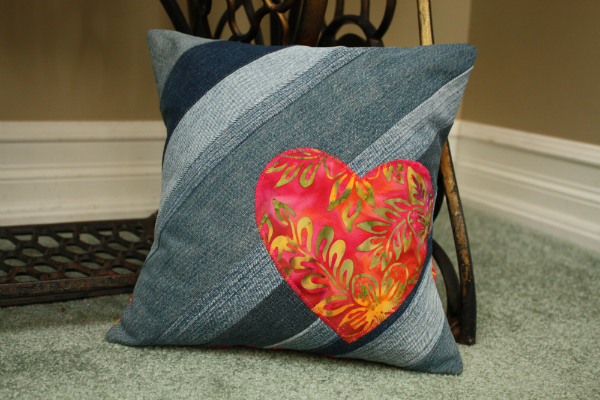 In addition to the 3 tutorials I linked above, you can also read about doing EPP with denim. I've also been playing with my quilting, as seen in my Friendship Galaxy mini quilt, and a wholecloth mini mini quilt. I am definitely having fun! All in all, I'd say I'm pretty well on track for my goals for the year. How about you? Did you set goals for the year (quilting or otherwise)? If so, how are you doing with them? *This post contains an affiliate link, which means if you click the link and make a purchase I may receive a small commission. This does not affect the price you pay. 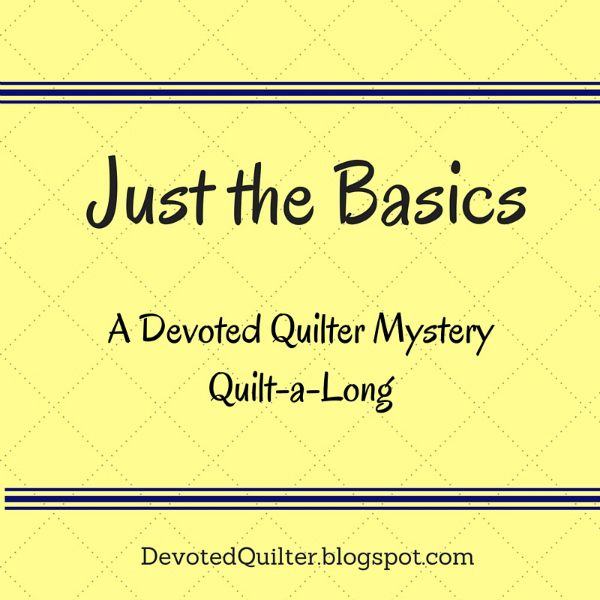 It's month 5 of the Just the Basics Mystery Quilt! Running from March to August 2016, the Just the Basics mystery quilt-a-long will require no special rulers and no scary techniques. The design is confident beginner level and there will be no paper piecing, no applique, no improv piecing and no y-seams! Not that there's anything wrong with any of those techniques, but sometimes it's fun to see what you can make out of basic blocks. I promise, the basics are anything but boring! Remember, you can choose to make the Just the Basics mystery quilt in the 48" x 48" baby/wall size or the 60" x 72" throw size. 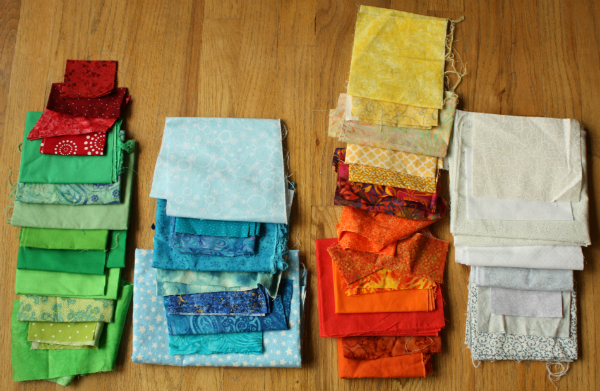 Either way you'll cut and piece the units the same, but you'll make more of each unit for the throw quilt. If you're on Instagram, don't forget to share your progress! Use #JustTheBasicsMysteryQuilt and tag me @devotedquilter. In case you're just getting started, March was fabric selection, April was HSTs, May was Flying Geese and Square-in-a-square blocks and June was More HSTs (But Not as Many!). Now let's get going! We'll be making flying geese again this month and this time they'll be the opposite of the ones we made in May. Then we'll join the all of the flying geese together to make the next unit for our quilts. 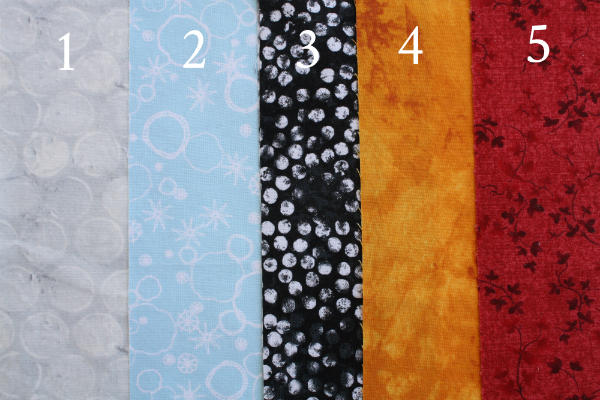 As a reminder, here are the fabrics I've chosen for my quilt. We'll be making these geese with fabric 1 'sky' and fabric 2 'geese'. In my fabrics, that means grey skies and blue geese. For the wall/baby size, you need 64 flying geese. For the throw size, you need 120 flying geese. We'll chain piece again and use the same method as before to make 4 at a time. From fabric 1 - 64 squares 3 1/4" x 3 1/4"
From fabric 2 - 16 squares 5 3/4" x 5 3/4"
From fabric 1 - 120 squares 3 1/4" x 3 1/4"
From fabric 2 - 30 squares 5 3/4" x 5 3/4"
Once again, rather than repeating the full tutorial, I'm going to share a shortened version this month. If you want the more detailed version, it's all in May's post. 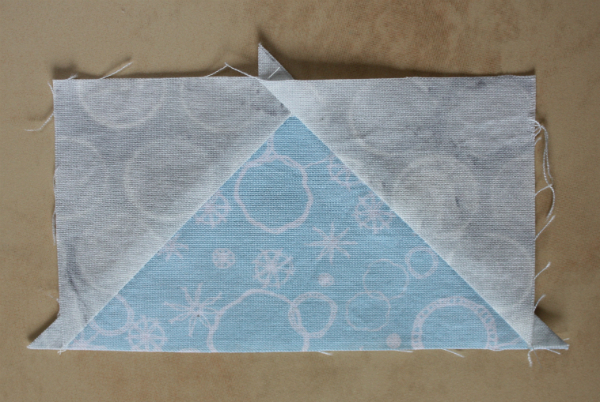 On the backs of all your fabric 1 squares, draw a diagonal line from corner to corner. Place two fabric 1 squares right sides together with each fabric 2 square as shown. 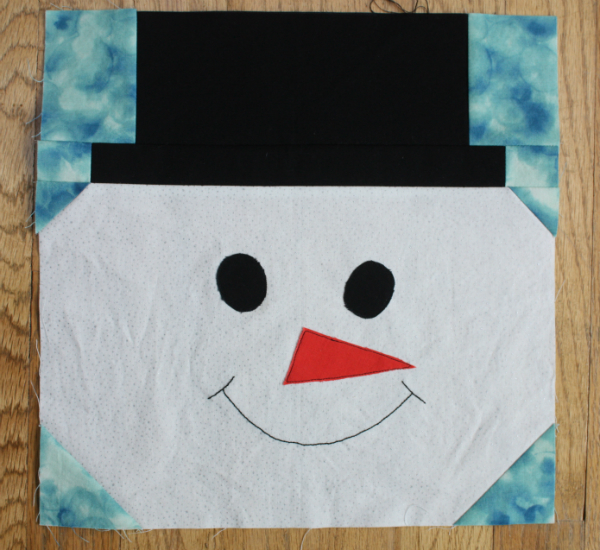 The drawn lines should form one continuous line and the fabric 1 squares should overlap slightly in the middle. Stitch 1/4" away from the line on both sides. Cut apart on the drawn line and press the units open. 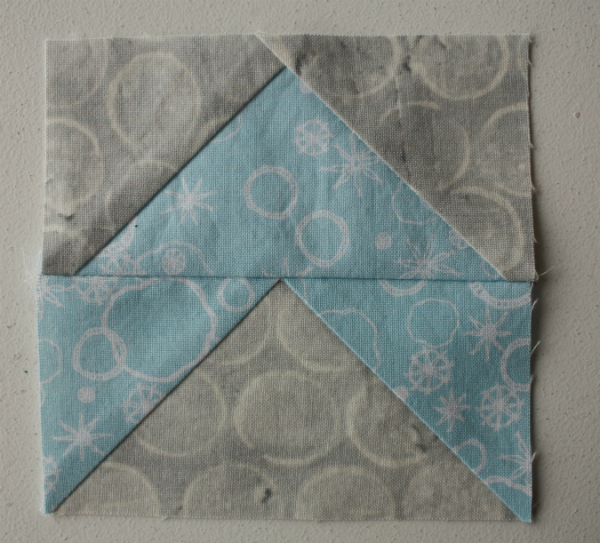 Place a fabric 1 square right sides together with each unit, being careful to position the drawn line as shown. Stitch 1/4" away from the line on both sides. Cut apart on the drawn line and press each unit open. Voila! Flying geese! Time to trim all those little imperfections away. First, line up the 45° line on your ruler with the diagonal line on your flying geese and the 1/4" line with the point of the triangle. Trim the top of the block. 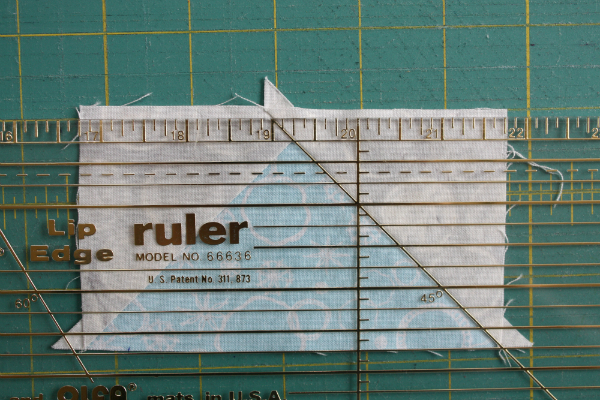 To trim the right side, line up the edge of a smaller ruler with the top of the block and the 2 1/4" line with the center point. Trim the right side. Then flip the block over, line up the edge of the ruler with the bottom of the block and the 2 1/4" line with the center point. Trim the left side. Trimming the bottoms can be done in batches. Position a few blocks with the tops of the blocks lined up on one line of your cutting mat and trim them to 2 1/2" wide. Now that all of your flying geese are made, we're going to put them together. For the baby/wall size, you need 64 unit 2. For the throw size, you need 120 unit 2. For each unit 2 you need one flying geese block from May's batch and one from this month's batch. Join them as shown, with the fabric 2 'geese' touching the fabric 2 'sky'. 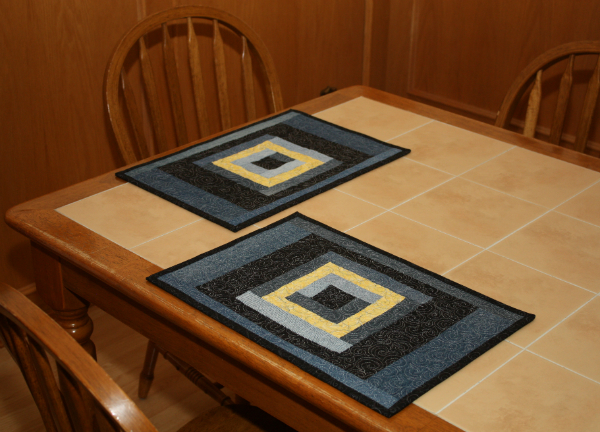 Because the blocks are all trimmed to the exact same size, they join together so perfectly! I am so excited for next month's big reveal!! It's time for another look at the fruit of the Spirit! This week we're looking at patience, but feel free to go back and get caught up if you're just joining in. You can read the introduction to this series, then read about love, joy and peace. Once again, here is our verse for this series: "But the fruit of the Spirit is love, joy, peace, forbearance, kindness, goodness, faithfulness, gentleness and self-control. Against such things there is no law" (Galatians 5:22,23). Okay, so this translation says forbearance, but other versions use longsuffering or, as I first learned it, patience. I find the nuances of those words to be interesting. Though they are synonyms, they don't quite mean exactly the same thing. Google dictionary defines forbearance as "patient self-control; restraint and tolerance" while longsuffering is "having or showing patience in spite of troubles, especially those caused by other people" and patience is "the capacity to accept or tolerate delay, trouble, or suffering without getting angry or upset." One puts the emphasis on controlling ourselves, another on the source of the trouble we are being patient about and the third on the reaction we are not exhibiting because we are being patient instead! Really, the translators used these different words in different translations because the original word, makrothumia, carries the connotations of all three english words. So, then, Paul wrote the word makrothumia meaning that the fruit of the Spirit is 'controlling ourselves in spite of troubles, especially those caused by other people, while exhibiting the capacity to accept those troubles without getting angry or upset'. Wow! That's a lot for one word to convey, isn't it? Would you say you have makrothumia? Or are you like me and find there is abundant room for improvement? One thing I have definitely noticed is that my patience evaporates when I am tired. I can remember when Zachary was a newborn and I lived in that sleep-deprived haze that is the first weeks and months with a new baby. Aiden was about two at the time, just learning to talk, and I must have used the phrase, "Mommy has no patience right now" a few too many times because one day he announced to his toys that "Ma ha no pa-ence now!" Yep, that was me. Still is some days. My first thought as I prepared to write about patience for today (other than Aiden warning his toys), was that God never gets tired. Psalm 121:3,4 says, "He will not let your foot slip—he who watches over you will not slumber; indeed, he who watches over Israel will neither slumber nor sleep." God doesn't need sleep, which means He never gets tired and He never has those moments when His patience evaporates because He didn't get enough sleep the night before. Isn't that a wonderful thought? 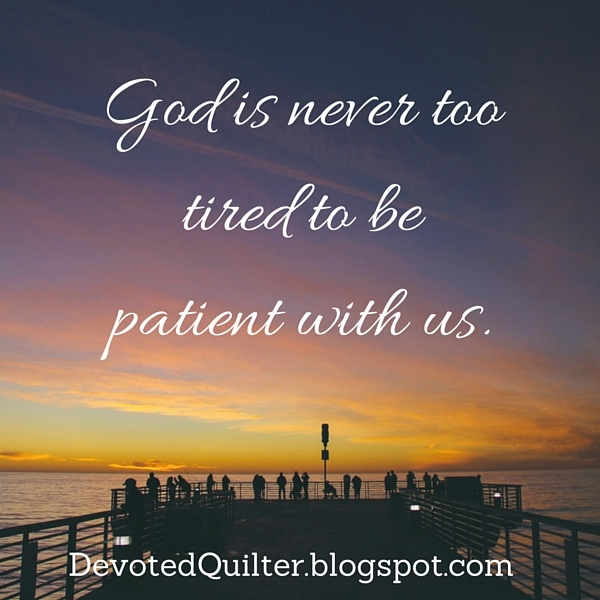 No matter how irritating or exasperating or frustrating we may be, God is never too tired to be patient with us. That is the kind of constant, predictable, unwavering patience His Spirit can cause to grow in us. The kind of patience that doesn't change, no matter how we are feeling or what our circumstances may be. The kind of patience we certainly can't create for ourselves because we don't have an inexhaustible supply. But He does. And He can (and will!) cause it to become part of us if we rely on Him. Moment by moment, irritation by irritation, we have a choice to make. Will we react out of our own limited supply of patience, or will we choose to let God's unlimited patience flow through us? I know three things for certain. 1. We will not always get it right. 2. We will never run out of opportunities to try again. And the best one of all...God will be patient with us when we get it wrong.